Numbers and Nationhood, first published in 1996, explores the Italian inflection of a Europe-wide phenomenon in the nineteenth century: the rise of statistics as a mode of representation in society. 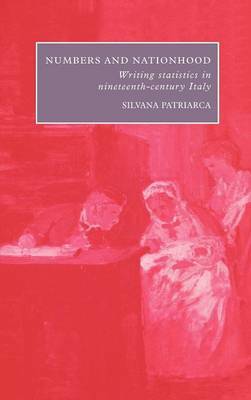 Silvana Patriarca examines the ideologies which informed the copious statistical literature produced between the 1820s, when statistical publications began to proliferate in the Italian states, and the 1870s, when a unified Italy entered a fully positivistic era. Her innovative study illuminates the relationship between the needs of an emerging nation and the uses to which statistics were put, generating a long-lasting image of Italy which nevertheless accentuated its internal territorial divisions. By examining the power of numerical representations, Numbers and Nationhood provides a fresh reading of the historiography of Risorgimento Italy and of positivism, bringing to the fore issues of science, ideology, and representation.